Each year, approximately one in four older adults fall. In recognition of National Fall Prevention Awareness Day (September 22 and the weeks surrounding it), a group of first- and second-year Doctor of Physical Therapy (DPT) students from Georgia Southern University Armstrong Campus joined physical therapy students from all seven accredited physical therapy programs in Georgia along with clinicians throughout the state in performing fall risk assessments on older adults. 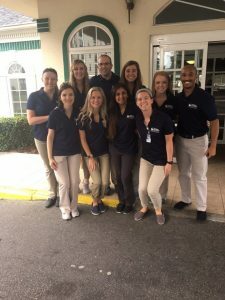 Georgia Southern DPT students performed assessments on residents at Savannah Commons, and those attending Windsor Forest and Crusader Golden Age Centers. “We wanted to go to places that are close to the Armstrong Campus,” said Dixie Edalgo, second-year DPT student. The close proximity allowed for students to be able to conduct assessments in between classes and helped to foster a sense of community near the Armstrong Campus. Screenings were, in part, to answer the call for increased involvement of state academic physical therapy programs in screening activities, and to answer a call from Anne Lorio, a faculty member at Georgia State University, who lost her father due to the consequences of a fall earlier this year. Sixty one senior adults were screened over three days. Based on the Center for Disease Control and Prevention (CDC) criteria, 22 senior adults were found to be at high risk for falls and 31 were at moderate risk for falls. “Most of those found to be at high or moderate risk for falls were unaware that anything was wrong,” said second-year DPT student Delicia Bell. Individuals found to be at moderate and high risk for falls were advised to consult with their primary care provider. Though most senior adults were appreciative of the efforts of Georgia Southern’s DPT students, it was the students who were grateful and learned a great deal from the senior adults. “I was surprised how much I enjoyed myself. I learned a lot from just talking with the senior adults. I was really surprised how at risk so many of them were,” said Philemon Miller, a first-year DPT student.